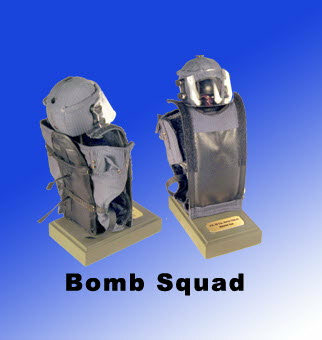 Police Bomb Squad uniform and helmet [DSK-332] - $69.50 : Metalcraft by Blair - military gifts and memoribilia. This is really unique. it is a partial of the bomb squad uniform -- we do not have room for the complete uniform. What a unique way to say thanks for a job well done or congratulations on your promotion. the base is an aluminum weight painted it measures 2 1/2 " x 4"